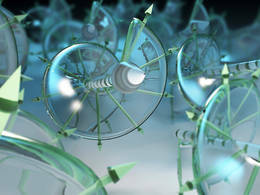 Magnonics is a research field in nanoscience exploring spin waves, i.e. magnons, to transmit and process information. Magnons are elementary spin excitations in magnetic materials which exhibit a wave-like state. These can either be localized or propagate through the solid. Strikingly, the wavelength of magnons is orders of magnitude shorter than that of electromagnetic waves (photons) of the same frequency. Hence magnonics fosters the development of nanoscale devices and enables nano-optics with spin waves as well as high-density integration. The magnonic crystal, i.e., the magnetic counterpart of the photonic crystal, is a paradigm of magnonics. Ferromagnetic materials with periodically modulated properties offer an artificially tailored band structure for spin waves consisting of allowed frequency bands and forbidden frequency gaps. Thereby the full control of the flow of spin waves is achieved. We follow two approaches: the 'bottom-up' approach where Skyrmions (a kind of magnetic vortex) form a periodic lattice in helimagnets with lattice constants of down to about 20 nm, and the 'top-down' approach where we nanopattern ferromagnetic thin films. Before magnonics turns into applications, there is lots of fundamental physics to be explored. This site provides an overview of our research on spin waves at the nanoscale. Transmission through a Permalloy antidot lattice, after pulsed spin excitation at the top. The magnetic field of 100 mT is applied in horizontal direction. The animation covers about 2 ns. For further details, see link "magnonic crystal".